Okay. I'm not gonna talk too much about my new node-webkit project Nodster because I also have a lot of studies to do (exams next week!). I'm still not streaming the mp3s properly. I think that I'll never be able to do it through the html5 audio and I need to look up other solutions. The do it yourself approach seems appealing and I'm gonna look into node speaker and node lame. I'm using node google to crawl google and get links. It's not working properly and I'll have to dig into crawling google myself. I'm parsing pages with a regex, it really seems to be slowing everything and I'm gonna look into using a dom parser. I heard about cheerio, is it good? 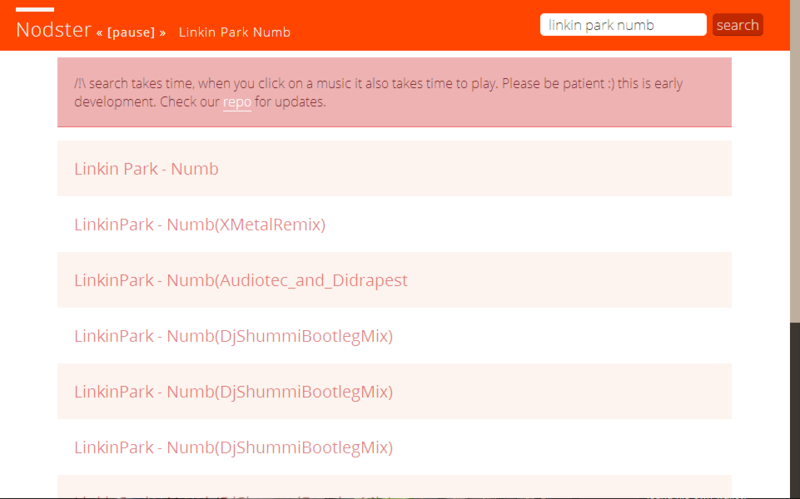 It checks each mp3 for size (thanks to the headers) and download a bit of each to get metadata. If the link is clicked, the mp3 is downloaded to a buffer.mp3 and played. Anyway, this app is bringing me a lot of problems to solve and it's pretty interesting :) some people have already forked it and someone has already requested a pull, so if you wanna help. Come and fork it! I have some node code to scrape google (that works) with captcha solving support (:p) I may push in on my github if you want to play with it.